Back in 2012, the South Carolina Department of Corrections (SCDC) made "Creating and/or Assisting With A Social Networking Site" a Level 1 offense [PDF], a category reserved for the most violent violations of prison conduct policies. It's one of the most common Level 1 offense charges brought against inmates, many of whom, like most social network users, want to remain in contact with friends and family in the outside world and keep up on current events. Some inmates ask their families to access their online accounts for them, while many access the Internet themselves through a contraband cell phone (possession of which is yet another Level 1 offense). Through a request under South Carolina's Freedom of Information Act, EFF found that, over the last three years, prison officials have brought more than 400 disciplinary cases for "social networking"—almost always for using Facebook. The offenses come with heavy penalties, such as years in solitary confinement and deprivation of virtually all privileges, including visitation and telephone access. In 16 cases, inmates were sentenced to more than a decade in what's called disciplinary detention, with at least one inmate receiving more than 37 years in isolation. Prison systems have a legitimate interest in keeping contraband devices out of their facilities and preventing inmates from engaging in illegal activities through the Internet. But South Carolina's policy goes too far, and not only because of the shockingly disproportionate punishments. The policy is also incredibly broad; it can be applied to any reason an inmate may ask someone outside to access the Internet for them, such as having a family member manage their online financial affairs, working with activists to organize an online legal defense campaign, sending letters to online news sites, or just staying in touch with family and friends to create the type of community support crucial to reintegrating into society. Facebook has processed hundreds of requests from SCDC officers who want inmates' profiles taken down. Facebook's stated policy is to suspend these pages under the auspices of Terms of Service (ToS) violations—specifically, purported violations of terms banning users from using aliases or sharing passwords with third parties—effectively allowing SCDC to censor inmates' online speech. Yet, as described below, Facebook goes beyond its stated policy and agrees to SCDC requests to censor inmate pages even when no ToS violation has been alleged. In addition, Facebook seems to have taken no action against SCDC investigators who regularly violate these same terms in uncovering inmate profiles. What's more, this process is veiled in secrecy, with both Facebook and SCDC failing to create a public record paper trail documenting the takedown of inmate pages. It's time for South Carolinians to demand a review of this policy and for Facebook to reevaluate its role in helping prison systems censor and excessively punish inmates. South Carolina adopted a Level 1 social media offense [PDF] to punish "Creating and/or Assisting With A Social Networking Site," defined as: "The facilitation, conspiracy, aiding, abetting in the creation or updating of an Internet web site or social networking site." SCDC defines "social networking" very broadly, covering everything from YouTube and Twitter to blogs and email, although all of the cases EFF reviewed [PDF] involved Facebook. Investigations are conducted by corrections officers and inmates are convicted during disciplinary hearings that often last mere minutes. The average punishment length for a "social networking" case was 512 days in disciplinary detention, and the average length of lost privileges was even longer. So disproportionate are these punishments that South Carolina doesn't have space in disciplinary detention for all the offenders and "regularly" is forced to put the punishments on hold. In the cases of the three above inmates, SCDC says that none will serve the full punishment since they will be released from prison within the next five to 10 years. As punishment for social media use, inmates also lose "good time" days that would had otherwise resulted in early release. Since 2012, inmates have collectively lost 14,564 "good time" days, the equivalent of 44 extra years in prison. In fiscal terms, that's approximately $842,000 [PDF] more that taxpayers will have to pay to keep inmates behind bars—just because they posted on Facebook. SCDC also uses outside contractors in its investigations, paying $12,500 to an unnamed entity for unspecified services. All but the price tag was redacted from the document [PDF] provided to EFF under South Carolina's Freedom of Information Act. Certain other tactics are more alarming. In response to inquiries from EFF [PDF], SCDC acknowledged that staff obtained inmate passwords through various means, including from inmates informing on inmates, family members, and the inmates themselves. In violation of Facebook's Terms of Service, SCDC staff have used those passwords to access inmate accounts. SCDC investigators have also created fake social media profiles in order to catch inmates in the act—again, a clear violation of Facebook's Terms of Service. Unfortunately, all information regarding these investigations is shielded from disclosure under the state's Freedom of Information Act. In addition to the potential legal issues these practices may raise, the policies also pose problems for Facebook, which, as of February 3, has processed 512 "deactivation requests" from South Carolina corrections officers since 2012. Facebook has made it all too easy for prisons to report inmates for having profiles: the site has a form titled "Inmate Account Takedown Request." A corrections officer only needs to enter a few pieces of information about the inmate—the inmate's name, profile link, and the crime for which they're being imprisoned, but not the purported violation of Facebook's Terms of Service—to get the inmate's profile taken down. In direct discussions with EFF, Facebook repeatedly asserted it does not enforce prison policies. Rather, according to Facebook, when a corrections officer contacts Facebook about an inmate page, Facebook staff may suspend the account on the grounds that the inmate violated the site's Terms of Service. Specifically, Facebook pointed to terms that forbid users from sharing their passwords or otherwise allowing other people to access their accounts, a practice common among inmates. Facebook claims that they suspend inmate accounts for violations of this policy not only because of the ToS violation, but also because it protects the inmate's privacy. 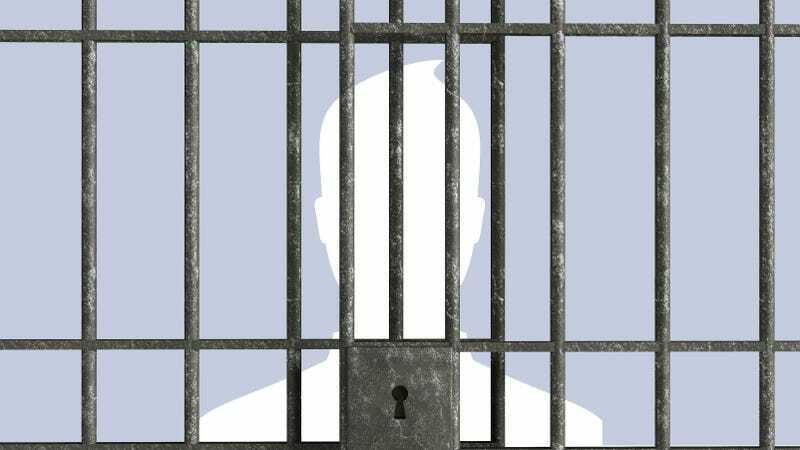 Facebook also forbids the use of aliases, which inmates also frequently employ. However, prisons are very aware of how to exploit Facebook's Terms of Service, with the Federal Bureau of Prisons even quoting the terms in handbooks [PDF] and presentations [PDF], adding that "Facebook also deactivates prisoner pages, regardless of who set up the page." Facebook says this isn't true, but its claim that it does not enforce prison policies is contradicted by correspondence that shows Facebook explicitly censored a South Carolina inmate's page when no ToS violation was alleged. In July 2014, a South Carolina corrections officer emailed Facebook asking for the removal of the profile of an inmate who had violated prison policy by accessing Facebook through a cell phone. Accessing Facebook through a contraband cell phone in itself does not seem to be a ToS violation. But as the below email shows, Facebook still removed the page—not for a ToS violation, but for breach of "inmate regulations." This was the only email chain [PDF] between Facebook and SCDC that EFF received in response to the FOIA request. That's because Facebook's system allows for secret censorship. Inmate takedown requests usually occur through Facebook's online form, which, as a Facebook employee told SCDC in a follow-up email, does not generate a receipt email. This means that more than 500 inmate take down requests have been filed without any kind of paper trail accessible to the inmate or the public—a lack of transparency that is simply not acceptable when government-instigated censorship is involved. Even if you take Facebook at its word—i.e., that it only enforces its own Terms of Service (despite the evidence to the contrary)—Facebook is guilty of applying a double standard when it comes to ToS violations. SCDC's practices of logging into inmate's accounts and creating fake profiles is a clear violation of not only its ToS, but also the very same terms inmates are accused of violating. Despite SCDC's rule-breaking, Facebook allows SCDC to maintain its own public Facebook page, where it posts career fair notices and positive news stories about its programs. When EFF pointed this out, Facebook said it would remove any of SCDC's secret alias pages we could identify—but this is a next to impossible feat given that information about such secret aliases isn't publicly available through South Carolina's FOIA. We're also calling on Facebook to embrace the position that inmate communication often has public value, such as when inmates raise issues about possibly unconstitutional prison conditions and other irregularities in the criminal justice system. Hold law enforcement agencies, such as prisons, accountable for abusing Facebook's ToS. This post originally appeared on Deeplinks Blog, hosted by the Electronic Frontier Foundation (EFF).